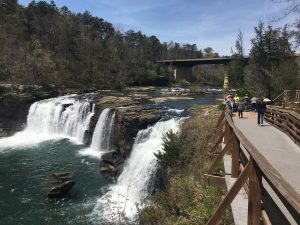 Saturday April 21, I made my first visit to Little River Canyon (LRC) near Fort Payne, AL and the Georgia border. I felt as though I already knew it well. 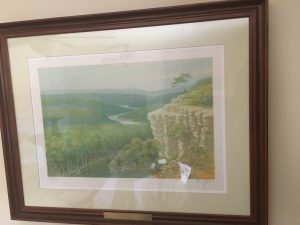 Twenty-one years ago when serving as Alabama Cooperative Extension Director, I accepted a nicely framed 15-by-21-inch numbered print (75/190) of the Canyon for Advancing the Mosley Environmental Awards Program. Since then, the print has adorned my home office wall in North Carolina, Alaska, Ohio, New Hampshire, and now back in its home state. What a thrill to spend the better part of a day in transit and at the Canyon! 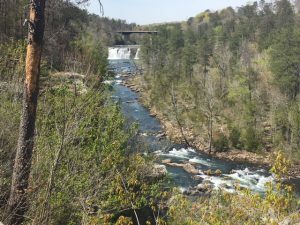 Picture the Cumberland Plateau at some 1,300-feet elevation. 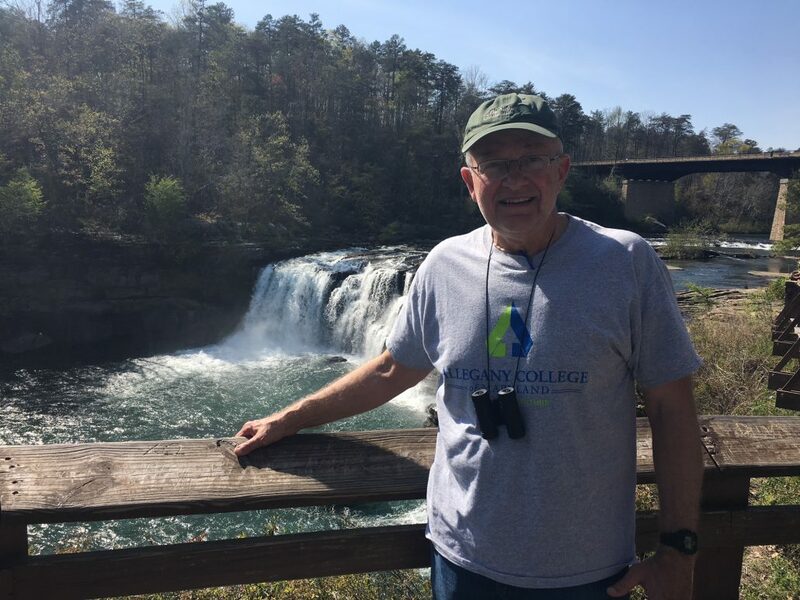 (For those who hunger for far more technical geologic underpinnings, see the Little River Canyon website or references like Jim Lacefield’s Lost Worlds In Alabama Rocks.) Little River Canyon’s headwaters drain the relatively flat Plateau top from from north to south. In effect, a river located atop a mountain. 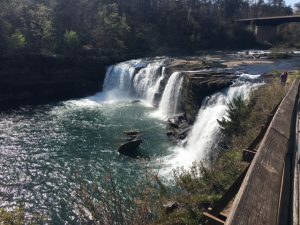 As volume increases down stream, along with the power of its flow, the river begins cutting a channel, which enters its own canyon-creation at Little River Falls. 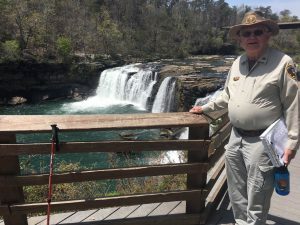 Official Little River Volunteer Jim Harlow, whom I accompanied from Huntsville, oriented me to the Preserve at the Falls. Jim participated in my LearningQUEST Nature’s Wisdom course during the winter. I appreciate his kind invitation for the day at the Canyon. 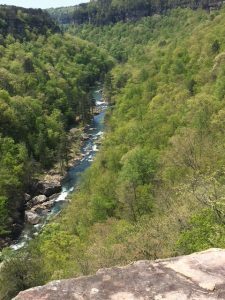 Eventually cutting the Little River Canyon to 4-500-feet below the Plateau, the effect is quite spectacular, especially given that the river incises terrain that appears otherwise plain-like. 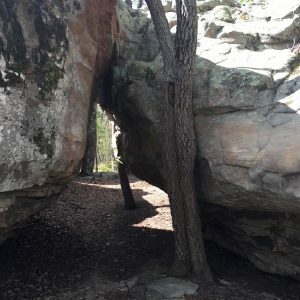 As I stood on the rim rock at various locations, I marveled over the tremendous quantity of rock long-since weathered, eroded, and transported from here (the entire massive void of the canyon was once rock) down the Alabama River system and emptied into the Gulf at Mobile Bay. There, over the vast sweep of time, deposited sediments, thick with millions of years of annual deposition, are weighting the crust, subsiding at a pace in balance with deposition. Ironically, those sediments could very well be the embryonic sandstone of a future plateau that some eons hence may be carved by a stream into a canyon. 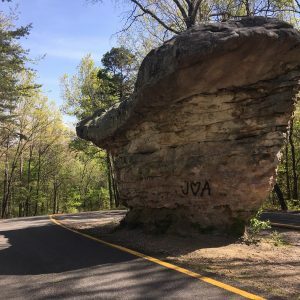 Those subsequent sandstone formations might contain relics of our own fossil record. The geologic cycle repeats itself. I’ve often noted that the summit of Mt. Everest, at nearly six miles high, is marine limestone! Today’s mountains will yield to the forces of water, ice, gravity, and time. Today’s sediments will cycle to tomorrow’s mountains. There is geologic wisdom in the old saw, “What goes around comes around”! 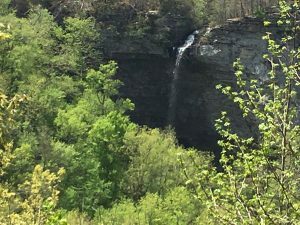 Grace Creek, a Little River Canyon tributary, drains inward, cascading over the rim rock into the chasm at Grace’s High Falls. Ample spring rains blessed our visit with plenty of water to furnish glories of both sight and sound. Jim’s Volunteer duties from 1-4:00PM gave me time only to explore the Preserve from the top, driving from place to place and enjoying a few trails. I will go back when I can devote more time to traversing the Canyon itself. This trip, as so many other encounters in life, served as a teaser… a compelling introduction. 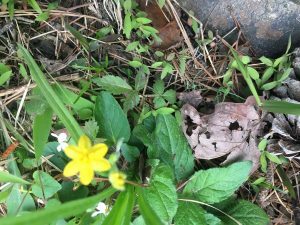 As I’ve said often in these blog posts, spring is my time to focus on flowering ephemerals. 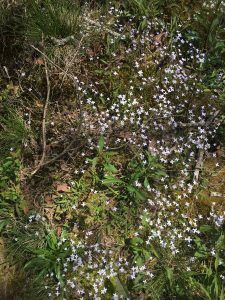 I’ve encountered bluets (below left) in flower for at least the past month. Here they are still in profusion. I may not see another until next spring, and feel blessed to have found thick colonies at the Preserve. I saw my first ever yellow star-grass (below right; Hypoxis hirsuta) — just two plants in flower caught my eye. Common wood sorrel (below left) greeted me across my Plateau wanderings. Yellow wood sorrel appeared frequently but mostly as scattered individuals. Catesby’s trillium (below right; Trillium catesbaei), a drooping flower with re-curved petals and sepals, made a single appearance. This individual is my first ever of this species. Gorgeous! 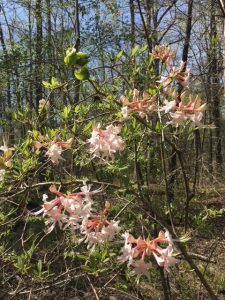 I’ve always rated wild azaleas high on my own ‘Wow’ scale. 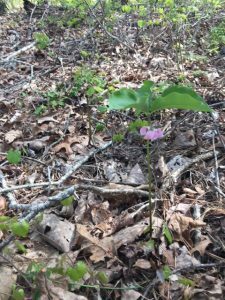 Among the first I’ve seen this spring, the one below shouted to me as I walked a trail where the predominately Virginia pine overstory is failing. The proximate cause I am told is the severe drought of summer 2016. The ultimate cause is attributable to the species’ principal ecological role as an early successional forest species. Its time has come — a time to every purpose under heaven. I’ll devote a future post to the Preserve’s fading Virginia pine stands. Part of the thrill of spring wildflower botanizing for me is seeing species for the first time, then seeking and verifying identity. I’ve recently subscribed to several regional Facebook sites for fellow wildflower enthusiasts. They have kindly assisted in identifying ones that leave me puzzled. 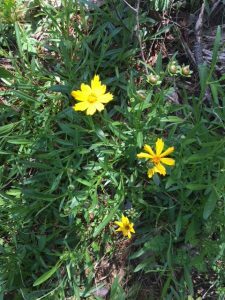 The lance-leaf coreopsis (below left; Coreopsis lanceolota) fits that category. 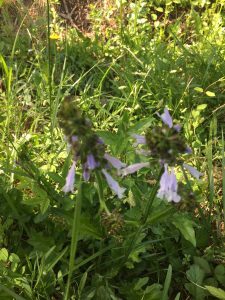 As did the lyre-leaf sage (below right; Salvia lyrata). 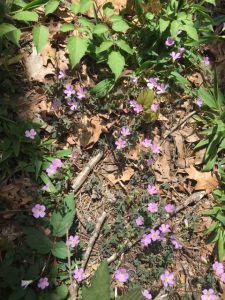 One of my new-found Facebook flora friends alerted me to a very handy wildflower app — I now have it on my iPhone and I am eager to try it. 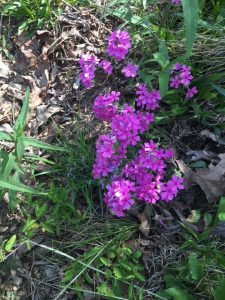 Phlox blessed the rim rock access road shoulder at least every couple hundred feet. Not rare… yet it makes an exquisite statement. Although I did not venture to the canyon floor, I tallied 25 species in flower. Had I trekked into the depths, I believe another ten would have made an appearance. Next spring I will plan a longer day and deeper hike. During my early forestry years traipsing the woods of the southeastern US with Union Camp Corporation (UCC), if only I had carried a handy digital camera. Oh, but that was during a past geologic era! Armed now with an iPhone and its decent camera, I can capture and share images of what I consider forest and landscape oddities. Mushroom Rock is among those already part of the LRC lore and magic. The rim road actual splits to pass… one lane on each side. 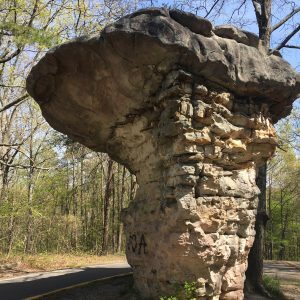 Clearly, the sandstone atop the mushroom is tougher than the weaker layers weathered below it. I will never understand how a so-called intelligent human being can deface such wonders with graffiti. Same sentiment for those who visit outdoors and leave behind memorials of their stop to include butts, candy wrappers, beer cans, and chip bags. I suppose that hundreds of millions years hence, such evidence will present strange imprints in sedimentary rocks not yet formed and far from uplifted. Combine the mineral with the biota — the intersection furnishes visual magic. A gentle kiss! This hickory several decades ago girthed (a verb I just coined involving relentlessly expanding diameter!) into an immovable object. What’s a tree to do? Callous-over and make do — adapt. I lot like what we as resilient individuals must do in living and learning. 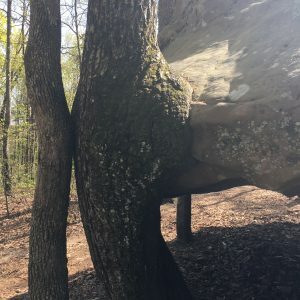 The meeting of rock and wood is not unusual. The kiss mechanism has proven evolutionary useful. 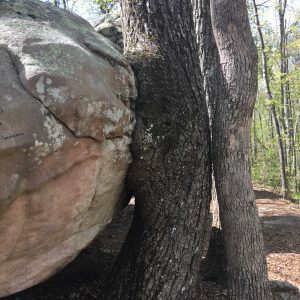 The affected tree taps open space above the rock or ledge. 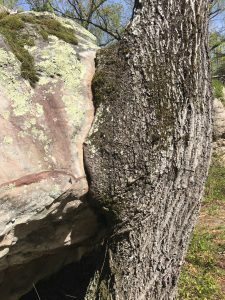 Rainwater drains from the rock to within reach of the tree’s extensive root system. The tree produces plenty of seed and extends the lineage forward. What more could a tree wish to secure? Now semi-retired, I am discovering a new pace. Really, perhaps better stated, I am adjusting to a new pace. Thirteen years as a university president (four different institutions) totally consumed me. I am not complaining — I loved being purpose-driven, passion-fueled, and results-oriented. I relished the often-blistering velocity of demands and action. Walks in the woods came infrequently and the duration far too short. To what am I slowly adjusting? I now have the luxury of slowing to a level of full absorption. 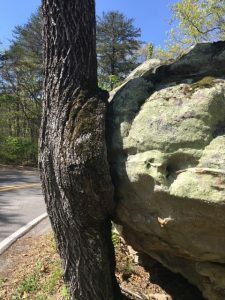 Appreciating the gentle hickory/sandstone smooch. Contemplating the significance of our human relationship to Mother Earth. Learning from Nature’s 3.5-billion-year-tested-ways. Observing, translating, and communicating those lessons. Writing to spread the gospel of informed and responsible Earth Stewardship. Luxuriating in Nature! Are we humans destined to be a footnote in Earth’s future geologic record? 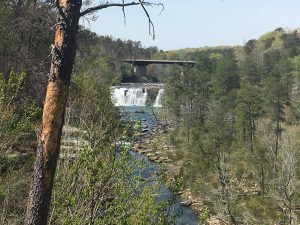 Nothing in Nature is new — the Cumberland Plateau sandstone derived from sediments eroded eons prior from mountains long since washed to the sea. Time means nothing to a rock. Nature’s beauty, magic, wonder, and awe are within reach every day… every place… to every person. Adaptation to adversity is Nature’s (and humanity’s) key to success. Aldo Leopold once observed: “Is education possibly a process of trading awareness for things of lesser worth?” Are we denying Nature’s wisdom — blind to it? What can be more important for me than what I am now doing? Isn’t that a question we all should answer? My next visit will be deeper, longer, and far more contemplative. Life is Good! May Nature Inspire all that you do.